This study aims for a small contribution to the knowledge base of the age-old ship chartering business. Generally, people are well aware about the theories of human behaviours, but face difficulties to incorporate these theories in their business strategies. 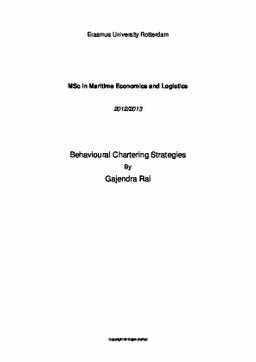 In this study attempt has been made to quantify these behavioural elements and use them in the process of decision making for the ship’s employment purposes. One of such theorems is “People do not consider costs as losses, but an investment”. On the basis of this theorem, risk- return trade-off can be charted out for an individual using MA-portfolio theory. Using the combination of person’s optimism and apprehensions, best trade-off can be chosen from the available set.